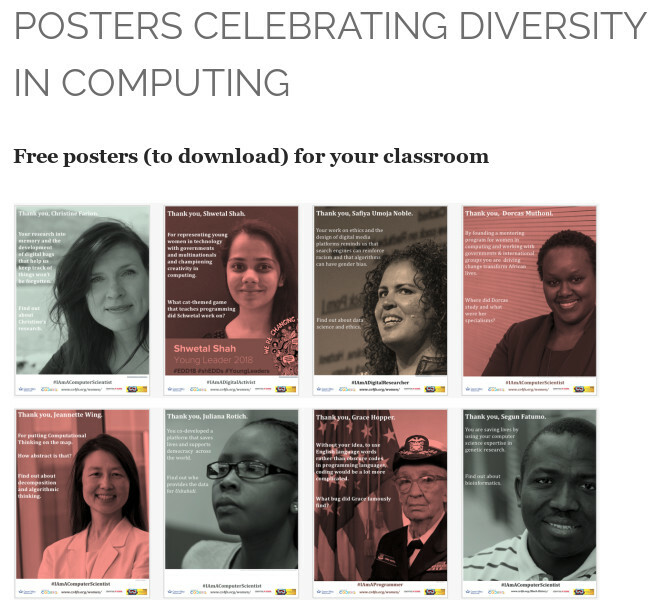 As part of our work for the Institute of Coding, the Queen Mary cs4fn team have created a set of posters for universities, colleges and schools to celebrate diversity in computer science. All too often celebrating diversity involves finding one or two ‘star’ people who have contributed to the field of computing. This seems to spotlight the few, rather than shine a broad beam on the many to show computer science really is for all. We therefore created dozens of posters which normalise the presence of a wide range of people of all ages, from different ethnicities and gender, from the past and present who are making a difference to our world through their work in computer science. If you have contact with local schools or colleges or friends at other universities, please share the posters with them. If you have people you would like to be included in the poster set please tweet #CSDiversity @QMEECS ‏@csf4n @IoCoding ‏with your nomination. Copyright © 2019 Equalities @ EECS. Powered by WordPress. Theme: Spacious by ThemeGrill.